The Sun's Disc Talismans (Illustrations No. 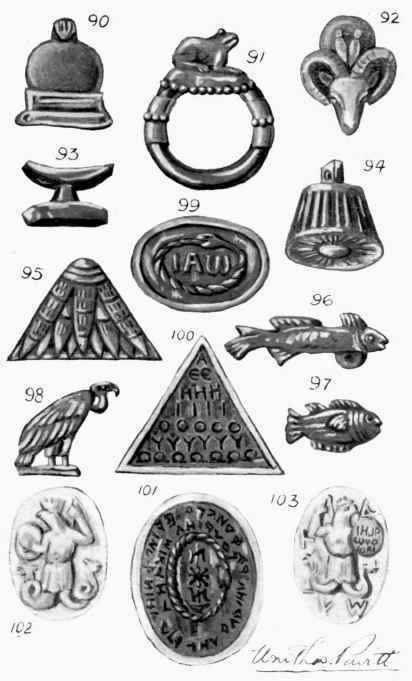 90, 92, Plate VII) are symbols of the god Ra, No. 92 being appropriately placed upon the head of a Ram, the symbol of the Zodiacal house Aries, in which sign the sun is exalted. It was worn for Power and Renown, and to obtain the favours of the great ones, being also an emblem of new birth and resurrection. The Frog Talisman (Illustration No. 91, Plate VII) was highly esteemed, and is an attribute of Isis, being worn to attract her favours and for fruitfulness. Because of its fertility its hieroglyphic meaning was an immense number. It was also used as a symbol of Ptah, as it represented life in embryo, and by the growth of its feet after birth it typified strength from weakness, and was worn for recovery from disease, also for Health and Long Life, taking the place sometimes of the Crux Ansata or Ankh, as a symbol of Life. The Pillow (Illustration No. 93, Plate VII) was used for preservation from sickness and against pain and suffering; it was also worn for the favour of Horus, and was placed with the dead as a protection and to prevent violation of the Tomb. The Lotus (Illustrations No. 94, 95, Plate VII) is a symbol with two meanings. Emblematical of the Sun in the ancient days of Egypt and typifying Light, Understanding, Fruitfulness, and Plenty, it was believed to bring the favours of the god Ra. Later it is described as "the pure Lily of the Celestial Ocean," the symbol of Isis, who is sometimes alluded to as "the White Virgin." It became typical of Virginity and Purity, and having the double virtue of chastity and fecundity it was alike prized for Maiden- and Motherhood. The Fish Talisman (Illustrations Nos. 96, 97, Plate VII) is a symbol of Hathor (who controlled the rising of the Nile), as well as an Amulet under the influence of Isis and Horus. It typified the primeval Creative principle and was worn for domestic felicity, Abundance, and general Prosperity. The Vulture Talisman (Illustration No. 98, Plate VII) was worn to protect from the bites of Scorpions, and to attract Motherly Love and Protection of Isis, who (it was believed) assumed the form of a vulture when searching for her son Horus, who, in her absence, had been stung to death by a Scorpion. Thoth, moved by her lamentations, came to earth and gave her "the Words of Power," which enabled her to restore Horus to life. For this reason, it was thought that this Amulet would endow its wearer with power and wisdom so that he might identify himself with Horus and partake of his good fortune in the fields of eternal bliss. The Sceptre (Illustrations Nos. 76, 77, 78, Plate VI) is a symbol of Isis, typifying power over the fruits of the earth, and was worn to preserve and renew youth and vigour, and to attract physical strength and virility.